Those are some strong assertions, so I should probably explain. Five days ago I stumbled across a particular image on imgur [which fills me in on more news than I care to admit] titled “I never played Candy Crush and i never will…(worth a read)“. 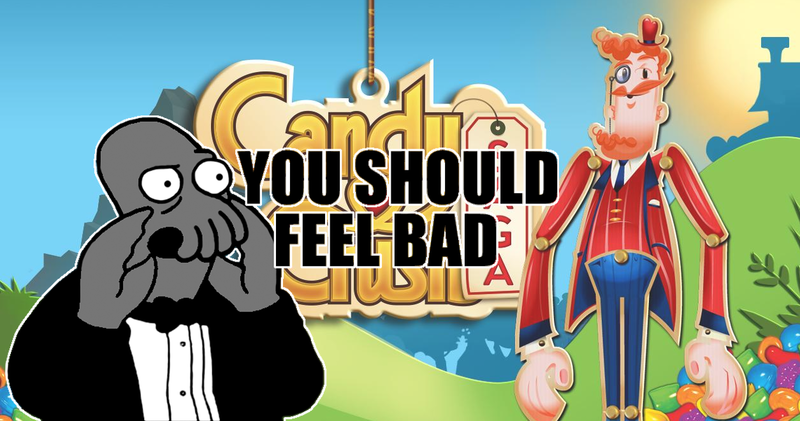 It was a screencap from http://www.candyswipe.com, in particular an open letter that its creator, Albert Ransom, wrote to King.com, the website/company responsible for Candy Crush Saga. See, King had been meaning to cancel registration of the CandySwipe trademark. How ridiculous that is should be apparent just by taking a look at the image above, which makes it clear how the game predates Candy Crush Saga [and any iterations of the game, in fact] by two years. If you think that Zacconi and King are the villains here then I need to stop you really quick. You don’t know the entire story. You see, both care so much about Candy Crush Saga that they have actually trademarked the word “candy” in Europe [solely for games, obviously]. There have also been motions to do the same with the word “saga” which is hilarious if only because it’s such direct mimicry of IFIB’s actions against the SSFA [check my review of Farmed and Dangerous for context]. What I mean to say is that Zacconi and King are not villains, but supervillains of the worst kind. -but after he took legal action against the company, rightly indicating that customer confusion was damaging his product, the opposing company decided to fight even dirtier. Since Ransom’s game was clearly from 2010 what King resorted to was buying a trademark to the 2004 game Candy Crusher. The intent of which was to use this older trademark to shut down CandySwiper. I’m going to create some stark contrast here by reminding you all that Dong Nguyen, the creator of Flappy Bird, took the game down himself. This is after making $50,000 a day. With that in mind I want to assert that Zacconi and the other higher-ups at King are bad people, and that they should go home and rethink their lives. This entry was posted in business, internet, money, morality, Shame Day, video games and tagged Albert Ransom, business, candy, Candy Crush Saga, Candy Crusher, CandySwipe, Dong Ngyuen, Flappy Bird, game, intellectual property, IP, is candy swipe the same as candy crush, King, King.com, legal action, open letter, phone game, Riccardo Zacconi, shame day, trademark, video game, villainy. Bookmark the permalink. They’ve also tried to mess with the indie video game “The Banner Saga” because of the word Saga. It’s really, really bad and hurtful to creativity. Are you implying that Brian K. Vaughan and Fiona Staples had better watch their backs? Yes. Yes I am. They are coming for you.